Your Pet is in Pain. It hurts, and it hurts to see them hurt. Now you can help! 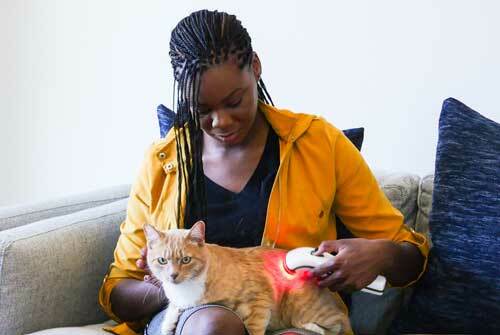 Download our free guide to learn how to reduce pain and speed healing with Photizo Vetcare light therapy. 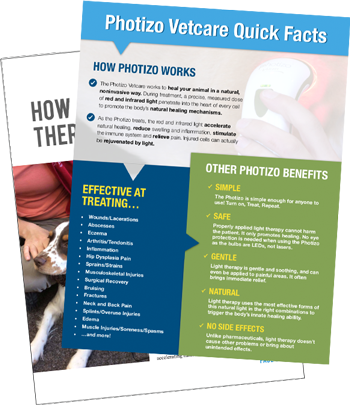 In this free guide you’ll learn…..
What is the Photizo Vetcare and how does it work? BONUS: 3 case studies from real Photizo users, and their results! After many years of trying everything on the market I decided to hire the Photizo unit. It really is a miracle machine. After only a weeks use, the trauma tissue has virtually gone. The Photizo I used on my English Bull Terrier did wonders for his skin rash. After just a few days the rash had completed cleared up and hasn't returned. Thank you very much for an awesome product! Red light therapy very often has a soothing, calming effect, particularly on equine patients. Even the most fidgety, highly strung animals can experience deep relaxation and endorphin release as the red light does its work.